MathType has three built-in rezisable square brackets. Left only, right only, and left + right. As with most MathType L+R brackets, you press Ctrl+[ (just as parenthesis are Ctrl+9). To create a single resizable bracket, press Ctrl+T,[ or Ctrl+T,]. All matrix shortcuts start with Ctrl+M. Press Ctrl+M,2 for a 2×2 matrix, Ctrl+M,3 for a 3×3, and Ctrl+M,4 for a 4×4. There is no shortcut for a 5×5. You can create a custom size matrix by pressing Ctrl+M,N. 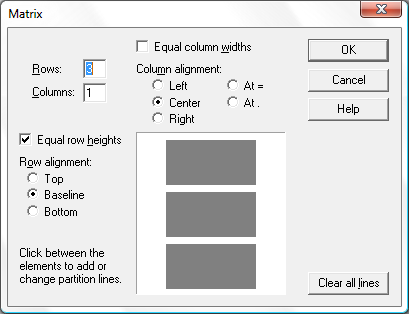 A dialog box will open and you can change the number of rows and columns as well as the alignment and other options. The size and options you last entered will be displayed, so you can press ENTER immediately without having to re-enter the information.